Even though ipilimumab is a promising antibody used for stage IV melanoma therapy, the response varies and is difficult to predict. We here report on a case of successful treatment with ipilimumab in dacarbazine-resistant metastatic malignant melanoma, including a review of the literature on the long-term treatment results. A 62-year-old patient with a history of a resected lentigo-maligna melanoma 5 years earlier and parotideal metastasis 1 year before was admitted with a newly detected 3.5 cm liver metastasis. Atypical liver resection was performed (R1). Immunohistochemically, CD3+ T-lymphocytes and CD68+ macrophages were detected at the tumour margins and within the parotideal and hepatic melanoma metastases. A sub-analysis of the liver metastasis showed scattered FOX-P3+ regulatory T-lymphocytes as well as multiple CD8+ effector T-cells. Chemotherapy with dacarbazine 1,000 mg/m2/day was administered at 4-weeks intervals for 3 months. 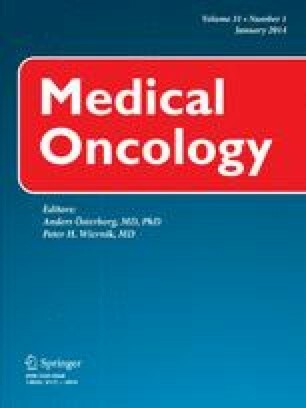 A follow-up positron-emission computed tomography and liver biopsy revealed melanoma metastases in the liver, lungs, and mediastinum. Compassionate use of ipilimumab was administered at 3 mg/kg every 3 weeks for a total of four doses. After an initial increase in tumour size, most lesions responded, but progressive axillary and cervical lymphadenopathy was observed before complete remission was achieved. Side effects included fatigue, dyspnoea, cough, upper abdominal pain with diarrhoea, and gingival hyperplasia. Now, 36 months after ipilimumab therapy and 8 years after the initial melanoma diagnosis, the tumour did not recur. It would be challenging to hypothesize that long intervals between diagnosis and need for treatment, clinical side effects, an initial increase in tumour size and the presence of intra-tumoural T-cells and macrophages might predict tumour response. The authors thank the patient for consenting to the work and publication of this manuscript. The authors thank Bristol-Myers Squibb for making it possible to include our patient in their compassionate-use program and thus giving us access to the therapy. National Cancer Institute. FDA approval for ipilimumab. Cancer drug information. 2013. http://www.cancer.gov/cancertopics/druginfo/fda-ipilimumab.